The Nintendo Switch is a near-perfect portable gaming platform, but the console still has one gaping blind spot to address; its total lack of streaming services. Yes, YouTube finally hit the Switch last year, but so far the likes of Netflix, Hulu, and Amazon Prime Video still haven't been announced, despite it being the perfect place for watching movies and TV on the go. Disney, however, might be about to change that with the upcoming release of its Disney+ streaming service, as we've just learned a ton of new information about the platform during the company's recent investor presentation. The key piece of info for console owners, though, is that Disney+ has plans to release on every smart device in existence, including the PS4, Xbox One, and Nintendo Switch. While a PS4 application has already been confirmed to release alongside Disney+'s 2019 release window, the company expressed its desire to bring the service to the Xbox One and Switch in the future too, suggesting talks are currently in works with Microsoft and Nintendo respectively. Presumably, we'll also eventually see the release of Disney+ on the PS5 and Xbox Project Scarlett in the future, providing the service finds long term success against its competitors (who are we kidding? It has Star Wars, Marvel, and Pixar; of course it's going to do well). 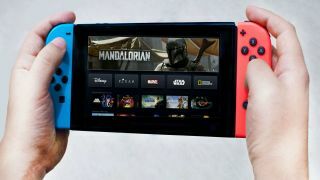 The best news is that Disney+ will also allow users to download and view movies and shows offline, which makes the service perfect for watching stuff on the go with the Switch. It won't be long before everybody's tearing up at Toy Story 4 on the train. While we wait for Disney+ to hit Nintendo's portable platform, here's the best Switch exclusives to play in the meantime. While you're at it, check out the Release Radar video below for a bitesize guide to everything you can't miss this week.